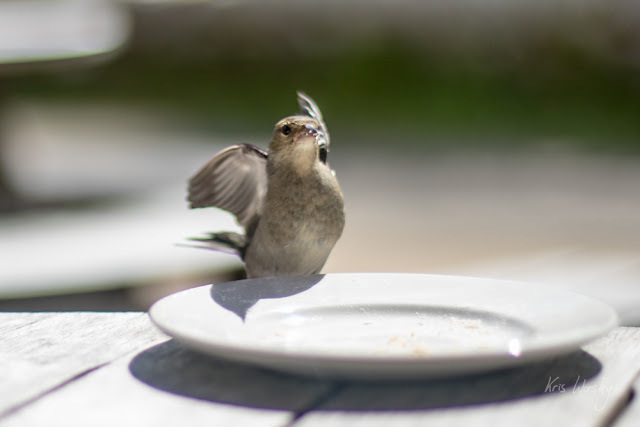 Human Nature - Kris Worsley Wildlife Photography: Birds at the table? Let them eat cake. A visitor came to the table where we were eating lunch. A little chaffinch. She was eager for the sugar, the fat, and the crumbs of our cakes were good. The cakes were our little treat we gave to ourselves bought from a little tea shop after a short walk on a long, hot day; quite naughty, really. Such a close encounter from such a bold but slender little chaffinch was perhaps the better treat however. We moved the plate a little closer to her, away from ourselves, and we encouraged her to eat. She flew away with some, perhaps carrying it to her nest, and then she returned for more. Cake is good for birds. Bread is less good, like eating an innutritious stuffing, it fills them up and does little else - and it can be quite harmful to young chicks (read the RSPB’s advice here). I should like to be a bird. Perhaps little chaffinch chicks don’t have to eat their crusts. Perhaps they can skip straight to dessert. So if a bird comes to your table, don’t offer them bread. Let them eat cake. It'll do them good (and, if I may say so , it'll do you good too).